Area 51 is adjacent to Nellis Air Force base and part of its borders stretch across desert once used for atomic bomb tests during the 60’s. Until recently Its very existence was officially denied by the U.S government. The base has been used to test and develop some of the military’s top-secret aircraft including the stealth bomber. Strange lights in the sky have been sited in the region for many years. There have been numerous rumors that these aircraft are in fact “back engineered” from the wreckage of recovered U.F.O’s. In 1989 Bob Lazar, a physicist, claimed to have worked in Area 51, and witnessed alien beings, and a flying saucer in one of the bases underground hangers. The areas remote desert location makes it virtually impenetrable for those that try, the “use of deadly force has been authorized”. I set out from Los Angeles at 7 am in the morning and headed north through the Californian desert on Highway I90. 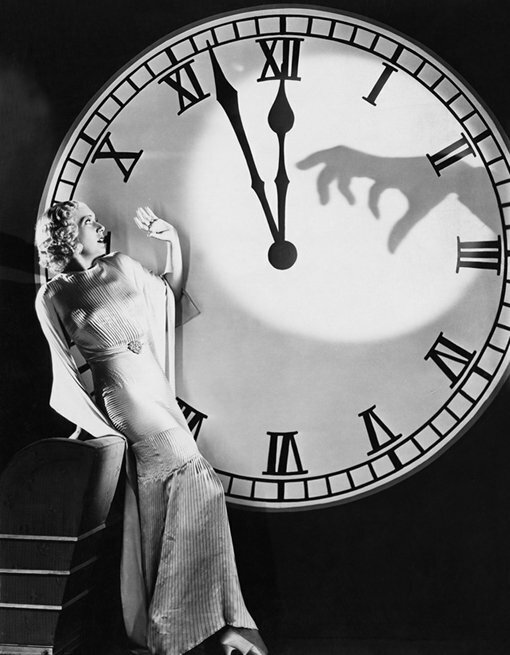 By midday I had reached Las Vegas. Once there I continued on-wards to the far end of “the Strip”. I was looking for what is referred to as the Janet air terminal. This is a small unmarked part of the main airport where Boeing 737’s fly many of the Area 51 workers from Las Vegas. I had a map printed from the internet that gave me its location, and being fairly close to the pyramid shaped Luxor Hotel it is easy to locate. After a few turns off the main street I found the terminal car park. There is actually very little to see, just a few hundred cars, and a small security checkpoint. I was however able to identify a few of the unmarked red and white Boeing 737’s sitting on the tarmac, which told me I was at the right place. I parked by the side of the road and watched for a few minutes, but the planes usually only take off very early in the morning for the half hour flight to the base. But this is at least the first piece of the puzzle that is Area 51. The nearby Tropicana Hotel overlooks the Janet terminal, and if you go to its upper floors you can get extensive views of the entire area. 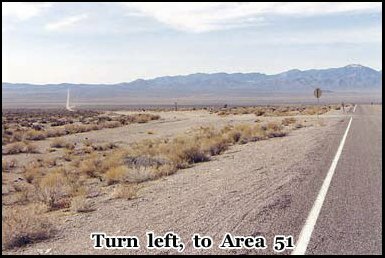 If you are going to make the effort of visiting Area 51, this detour won’t take you far out of the way, but it’s still a considerable drive to the base itself. I took a few pictures, had lunch in a nearby casino, and headed north on Highway 15 which soon branches off into Highway 93. It’s about a two hour journey to the start of Highway 375. This was officially renamed as the Extra Terrestrial Highway some years ago by the state governor, in a bid to increase tourism. 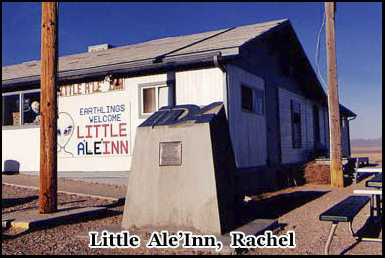 Once there its half an hour more to the dirt road to Area 51, and then about another 20 minutes after that is the small town of Rachel, where I would be spending the night at the Little Ale’ inn. The drive from Las Vegas is not an interesting one in terms of scenery, but as you get nearer your destination you will certainly get a sense of anticipation. 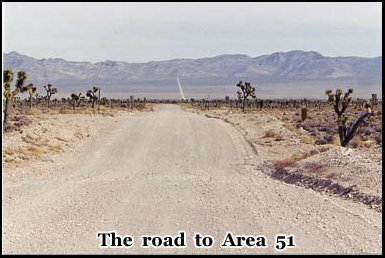 Over the years I have seen and heard so much about Area 51 on various TV programs, and internet sites that its reality and its myth are hard to separate. 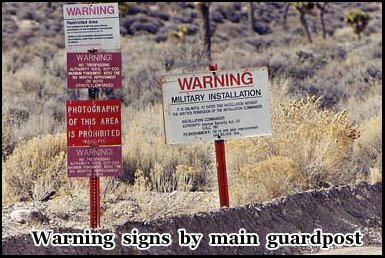 There are the many reports of people being arrested for trespass or taking pictures in prohibited areas, and then there are the UFO sightings and secret government military projects. I also had a very clear mental picture of the famous “use of deadly force authorized” signs. It is certainly a very well publicized “secret base”. You also have to question how much of this is real and how much may be just a smoke screen to divert attention away from something that may actually be top secret. Just before the Highway 375 turn off, I stopped at the small town of Alamo. You should fill up with gas/petrol here as it’s another 40 miles to Rachel, which although there is a one pump gas station there, quite often its closed. Beyond Rachel the next town is Tonopah 148 miles away. I could tell I was getting nearer to the base as they had begun to sell Area 51 guide books and bumper stickers. I bought a guide book, and just a quarter mile more and a left turn, and I was on the Extra Terrestrial Highway. If you continue on Highway 93 eventually it will take you to Salt Lake City , and once you turn off the traffic drops to almost zero. The few cars I did pass probably belonged to UFO spotters, residents of Rachel, or maybe even base workers at Area 51. 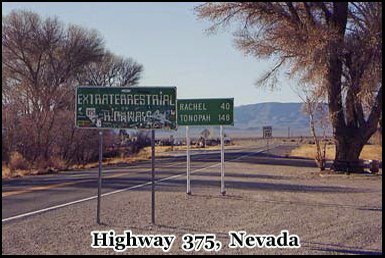 Straight ahead of you, you will see two green road signs, one says Extraterrestrial Highway , and has a small picture of a flying saucer above. The one behind says Rachel and Tonopah, which are the next two towns up a very long road. I stopped the car, setup the camera on a tripod, and took a few pictures standing in front of the signs. The one saying Extra Terrestrial Highway is covered in stickers from the other tourists that have also made their way here over the past few months. By now it was about 1pm in the afternoon and although it was January, the weather was hot, and the sky was clear. Once you drive on past the signs you may notice several cars parked on the side of the road. These could be the ones belonging to Area 51 workers that live in the surrounding areas. They leave their vehicles here in the morning, and are collected by bus and taken to the base. As soon as you start heading down Highway 375 into the desert, there is a definite sense that you are crossing into someone else’s territory. Having heard so many rumors about listening devices, and satellite security, and the infamous “Cammo Dudes” you do start to feel you are being watched. And maybe you are. I drove for about 15 minutes then came to a very long straight stretch of road. I stopped half way along, got out of the car and peered across at the mountains to my left. Somewhere beyond them was Area 51. I could look almost a mile behind me and half a mile in front along the narrow road. But there were no signs of any other people or cars, just desert and not a sound to be heard. It was quite eerie. I drove onwards a few more miles, until there is a steep hill that curves downwards to the right. On your left hand side you see what looks like a dirt road heading down through the desert then back up the other side to the mountain range, where it vanishes. At first I didn’t realize this was the road leading to Area 51. I hadn’t expected it to be so primitive, considering that at the end of it is a high security establishment with a multi billion dollar budget. But it is an effective deception, and I’m sure many people pass by, without ever realizing its significance. 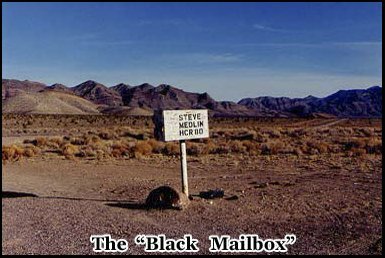 I soon came across something I did immediately recognize, the Black Mailbox, although it isn’t actually black anymore. This is a landmark to UFO enthusiasts it’s where they have gathered together for years to search the night sky’s. The original one was black, but was sold to a collector some time ago. The new one is covered in graffiti and stickers, and it belongs to ranch owner Steve Medlin, whose property boarders the area. After another 20 minutes the road slopes gently downwards and then up again into the distance. 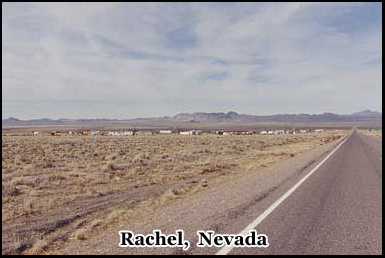 There is a sign on the right saying Rachel, and on the left is the town itself. Also on the left there is another unmarked dirt track, this is the entrance to the rear Area 51 guard post. The area is marked on the map as Groom Lake, and Nellis air force base. Officially Area 51 doesn’t exist and is actually just a grid reference. It was only in recent years that the government was forced to acknowledge it. This was a result of a court case brought about as a result of base workers trying to claim compensation for injury’s received as a result of exposure to toxic waste. As you pull into Rachel you will see that it’s little more then a few dozen mobile homes. There is a small shop/sometimes gas station, the yellow trailer of the Area 51 research center, and the Little Ale’ Inn cafe/motel. The population is around 600. Before the current owner took over the Little Ale’ Inn in 1988, it was called the Rachel bar and grill. Soon after a man by the name of Bob Lazaar went public with claims he had worked at Area 51, and seen several flying saucers whose technology the military were using in its own aircraft. These saucers are supposed to be stored in hidden bunkers on one side of the base known as Papoose Lake. There is some evidence to suggest that Bob Lazaar did actually work at Los Alamos, the United States atomic research center in New Mexico, and that coupled with the credible degree of technical information he has disclosed, makes his story something that can not be easily dismissed. There have been other less substantiated reports that Alien beings have also been sited in these hidden bunkers. 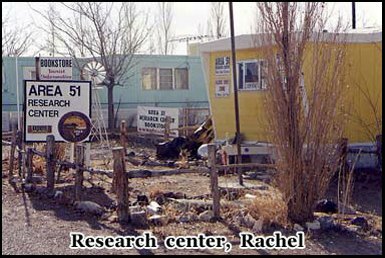 Once the Rachel bar and grill changed its name it began to sell UFO/ Area 51 merchandise. There is also a sign to the left of the building with a picture of a flying saucer that says self parking. In front of me there is a concrete marker with a plaque that was erected in 1988 to commemorate the opening of the movie Independence Day, and two of its stars Geoff Goldblum and Will Smith made their way down here for the occasion. I left my luggage in the car and opened the door to the Little Ale’inn. The walls are covered with newspaper articles and picture all relating to UFO’s or Area 51. In addition to the cafe there is a small shop that sells all sorts of Area 51 merchandise. Aside from t-shirts and hats, you can get books, bumper stickers and even mouse mats. There were only five other people inside at the time but after overhearing there conversations for a few minutes, I could tell they were here for the same reasons as I was. Some of them are military plane enthusiasts, some of them are UFO spotters, but all had obviously come to visit Area 51. Lunch was a tuna melt, and a chocolate shake, but you can order an alien burger, or the apparently world famous, alien burger with cheese. After lunch I checked into my motel room. Its definitely not five star accommodation. The rooms are in fact composed of a series of converted trailers parked at the rear of the Little Ale’inn. And it came as a surprise to me that I had to share the bathroom with the people in the other room. There is no TV signal, this far out in the desert but there is quite a big selection of UFO related videos that you can borrow from the video library in the cafe. You will find that your mobile phone signal cuts out, almost as soon as start to head down the Extra Terrestrial Highway , but there is a pay phone available. This all adds to the sense of isolation, and despite the crudeness of the motel room, it is definitely part of the Area 51 experience to stay here. There are a few motels back at Alamo, but they are almost an hour away. If you stay at the Little Ale’Inn you will get to meet some interesting people and you may get some inside information from some of Rachel’s local residents. I took the short walk down the main street to the Area 51 research center. 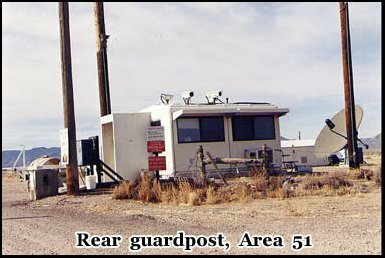 Where as the Little Ale’ Inn tends to push the more sensationalist accepts surrounding the base, and the UFO/alien theory, you will find the research center although it doesn’t discount these possibilities is more interested in Area 51s function as a secret military installation. It is no coincidence that you see “strange lights” in the sky when prototype aircraft are being flown above on an almost daily basis. Before it went public, the Stealth bomber was tested here. I’m sure that was mistaken for a flying saucer on many occasions. But whatever your reason for being here, there is definitely much more going on, then we are ever likely to know about. The staff at the research center will also be able to advise exactly how far you can go before straying over the base perimeter , as quite often it is not very obvious sometimes only indicated by some small hard to see orange posts. They can also tell you if there is much chance of having your camera equipment confiscated for taking pictures, as officially you are prohibited from doing so. It seems that although this has happened in the past it no longer seems to occur. This is largely due to the greatly increased number of Area 51 tourists that would make mass arrests undesirable. But in reality there is actually nothing that you can see or photograph that would be considered top secret. Besides this you can logon to the internet at your convenience and see magnified images of the base taken by a Russian satellite. The research center sells a better range of books and videos then the Little Ale’ Inn and I recommend the “Area 51” viewers guide by Glen Campbell. The person I spoke to told me that most of the visitors to Area 51 were actually from Europe as opposed to the states, although they do get the occasional organised bus tour running from Las Vegas . I went back to my trailer and read the guide book while I waited for it to get dark. It was about 1 pm and I decided to take a drive back out along Highway 375 to the black mail box. Although it’s in the middle of the desert it can get very cold at night and snow does occasionally fall in the surrounding hills. The sky was clear and there were lots of stars out. 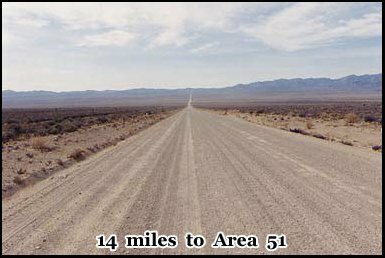 It’s quite an experience to drive out along this desolate stretch of road, knowing that Area 51 was just a few miles away. Just behind the range of mountains that was silhouetted on the horizon to my right. Of course as you drive you look skywards, hoping to see something, whether it’s a top secret military aircraft or something from further a field. I got to the black mailbox, got out of the car and sat on the front bumper. There was no one else around, and it was extremely cold, and you could see what looked like frost starting to form on the ground. I sky watched for about fifteen minutes, but didn’t see anything. But you whether you expect to or not, it is incredibly quiet and everything is very still and at night time you appreciate that this is just another part of the experience. I turned on the car heater and headed back to Rachel. Just before you get into town on your right hand side there is the remains of a once working silver mine, on the left is the dirt track leading to the rear guard post. I made a left and headed down the dark narrow track, there are a few houses and trailers to one side but their quickly left behind. There are of course no streetlamps, and although it’s not a particularly rough road it’s not that easy to see along it at night. I wasn’t sure how far up the guard post was, and I really wasn’t sure about what their response would be to someone approaching it at night. Up in the distance I could see lights from other vehicles from beyond the base perimeter. After going about a mile along the track I decided to head back. I spent a reasonably comfortable night in my trailer, had breakfast at the little Ale’ Inn and decided to drive back to the rear guard post in the daylight. After a couple of miles, in the distance I could see a few low level white buildings. As you get closer you realize that one of them is the guard post, that stands beside a control barrier across the road ahead . I stopped the car, and took a few long distance shots with a telephoto lens, not able to see if the guard post was actually manned. I drove a bit closer and could now pick out several security cameras along the top of the building. Although there didn’t appear to be anyone inside, you certainly knew somewhere someone was watching you. I drove right up to the barrier and decided to take a few close up pictures. I really didn’t want my camera equipment confiscated, even if there was a very minimal chance of this happening. So after a few quick shots, I gave a wave to the video cameras turned the car round, and drove off. I kept glancing in the rear view mirror to see if any of the “Cammo dudes” as the security guards had been christened were following me but the only thing visible was the gravel the tires were kicking up. The final part of the journey was the one I had been anticipating the most. 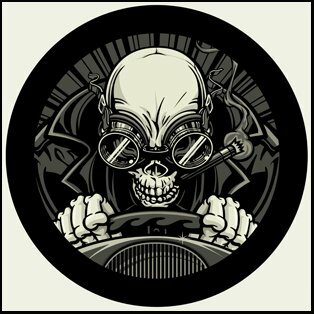 The long drive down the 14 mile dirt track to the base perimeter, and those “use of deadly force authorized” warning signs. I drove for about 20 minutes back up Highway 375. This time the Area 51 turnoff was to the right of me. There is a stop sign, where the track intersects with the main road. I turned into it. The first thing you notice is even at a fairly low speed is how much dust you throw up behind you. This certainly acts as an early warning to anyone up ahead, that there is a car coming. The road slopes downwards at first for about a mile, then starts to head back up a hill and level out. Each yard takes you closer away from the public highway, and closer towards what at this moment is really the unknown. All I do know is that somewhere just before the mountain range in the far distance there is a certain point, you do not cross. This time there is no barrier, but I have been told to look out for some orange posts that mark the perimeter. 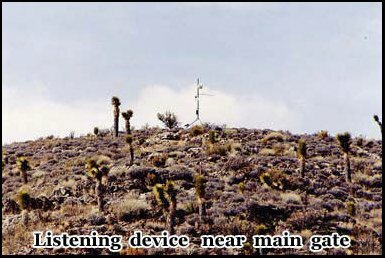 I started looking for the listening devices and motion detectors that are supposed to be hidden among the cactus. At this moment there are no signs of the base security guards, but as the main road gets further away, you do feel more and more cut off from the outside world. All the story’s you have read in books, on the internet or seen in the TV documentaries start running through you mind. I had heard about Area 51 about 10 years ago, when I lived in England and now I was here and 5000 miles from home. There soon becomes a point where the road dips again and curves slightly, and the distant highway is barley visible. It was just me on a dirt road, in the middle of nowhere, with a mobile phone without a signal, and a top secret military base that officially didn’t exist just a few miles away. It felt like being in an episode of the X Files. There are a few turn offs along the road, one of which lead to the Medlin ranch, the others snake out across the desert. The road was clearly very well maintained, and there were fresh tire marks in the gravel. I did pass one car heading past me in the opposite direction, the dust cloud give away its location long before I actually saw it. It was just a couple of guys in a pickup truck and I suspect they were doing the same thing I was. But after they sped past me that was last vehicle I saw on the road for the rest of the journey. I knew the track was about 14 miles long, you get past the halfway point and if you look behind you to the horizon the main highway has now completely vanished from site. I had sent the odometer to zero, as I first headed down the turnoff, it now read 12 miles. The mountain range ahead of me has come into view. Then there is a bend in the road and up on a hill to your left hand side there is a metal pylon with an antenna on it. This is a monitoring device, so if this one is so clearly visible there must be many more that aren’t. At this point you notice orange markers on one side of the road and the warning signs on the other. There is no barrier, but as I slowed the car down up on another ridge to my right was a white four wheel drive vehicle with two men sitting in it. One with a pair of binoculars trained on me. If you go beyond this point, you will get arrested. You can see the sign that say use of deadly force authorized, there are no witnesses and your 14 miles away from the public highway. There is another sign that says photography is forbidden. But on the other hand, you didn’t come all the way out here without recording the event. I got out of the car, pretended to ignore the two guards in the white utility vehicle and took a few hurried pictures. Then for the final one, I adjusted the zoom lens to its maximum turned to the two men looking down on me from up on the hill and ran off a few final shots. 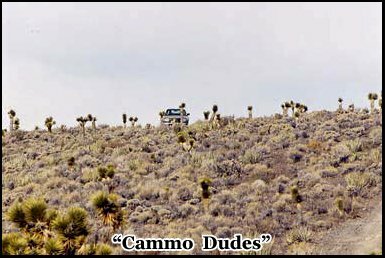 This is the moment when if the “Cammo Dudes” are going to head on down the hill towards you, they will. It didn’t happen on this occasion, but as you drive back along the long road you came in on, the return journey seems a lot longer, and you feel that somewhere behind you there are more eyes upon you then the ones you can see. This was certainly a worthwhile trip, and does actually have a least some element of real danger to it, although in reality it is in fact minimal. But Area 51, is somewhere where although you can come close to, you will never arrive at. This means that many of the myths and legends about it, still retain there mystery. Hey Buddy!, I found this information for you: "In Search Of UFO’s At Area 51". Here is the website link: https://www.chasingmidnight.com/area-51-ufos. Thank you.